One of my favorite things to do in Hawaii is going for hikes. Thankfully my boyfriend loves to hike too. We usually do a fairly easy 2 mile trek up to Makapu’u Point. It’s a beautiful view and we take pictures there at the highest point every year! Here’s this year’s photo. This year we did a different hike. 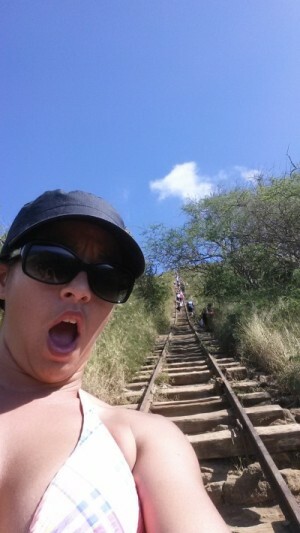 Koko Head Trail. This wasn’t a long hike (approx. 1.5 miles from parking lot to the top). What makes this trail so difficult is the steep incline of about 1,200 feet. Imagine the railroad ties (that make up the stairs for the trail) were once part of an incline tram system during World War II, which was used to haul military personnel and supplies to the top. When researching this hike, most people said there were about 1,048 steps. Personally, I think it’s more because the railroad ties weren’t normal steps, so I found myself taking 2-3 steps in between each “step”. Throughout the hike I would find myself stopping and looking up to see how far we still had to go. It was mentally exhausting. There were times when I wasn’t sure if I could finish. I’d see people passing me every time I stopped. What kept me going was seeing people much older than me working there way back down encouraging everyone that was on their way up. Eventually I had to stop looking at what was ahead of me and start looking at where I had come from. Every time I stopped the parking lot got smaller and smaller. This gave me a some sense of accomplishment. I knew I still had some time before reaching my ultimate destination but knowing how far I had gotten without giving up gave me hope that I would finish. 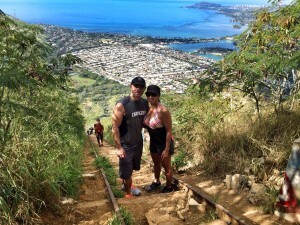 We eventually got to the top and the views were breathtaking. 360 degrees of pure beauty. While waiting for my legs to stop shaking and the feeling of nausea to go away I just sat at the top and looked down the mountain. This trail reminded me that in life we are often on a long journey towards reaching our goals and sometimes it’s better to look back at how much progress you’ve made and keep that in my mind as we continue to move to the finish line. As much as I would like to say I didn’t stop on this trail, I did (about 5 times) but with every stop, I learned to appreciate my progress. I hope you can look at your fitness journey like I did with this trail. All we can do is strive for progress, it won’t always be smooth sailing. Take those moments of challenges and reflect on your progress and then embrace the work to come. When I looked forward all I saw was more work… Looking back gave me confidence to keep moving forward to finish what I started!